Bone china tea cups were very popular when I was a young girl. My Mom, Aunts, and Grandmas all had several. Any young girl that was planning to become a "lady" would of course be fond of tea cups and saucers. I was no exception. My Toy Tea Set is in perfect condition and made in Japan. 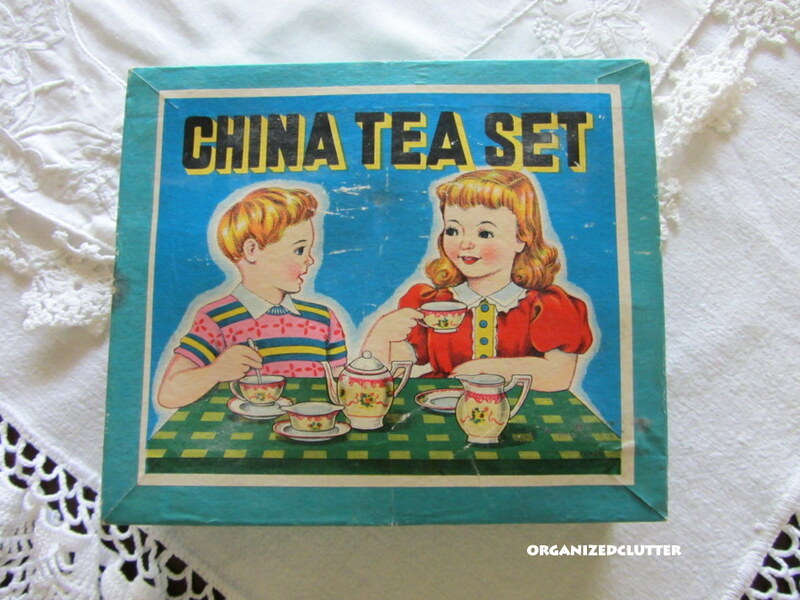 Did you have a toy tea set? 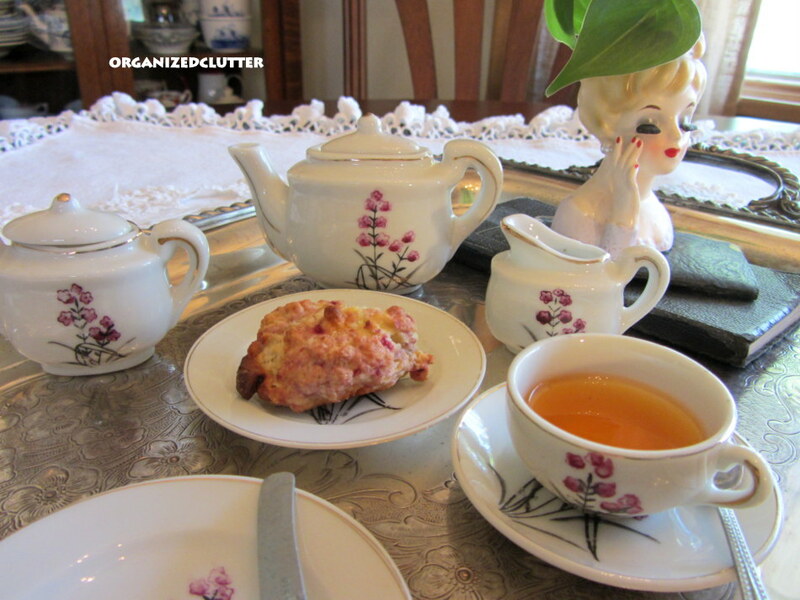 I'm serving raspberry white chocolate scones and cinnamon vanilla herb tea. Nothing blooming in the garden so I'll settle for a few philodendron leaves in a head vase. Joining Ruth at Antiques and Teacups. 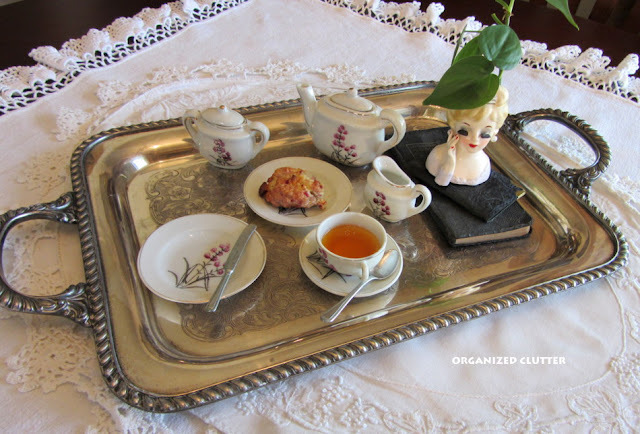 Your little tea set is so cute and oh how wonderful that you still have it! It's in such good shape too. I had a couple little tea sets but my mother threw them out after a while, unfortunately. We moved around a lot when I was growing up and I guess she needed to purge some of my things. How I wish I could have saved them. Thank you for sharing your adorable tea today with my Pink Tea and have a delightful week. 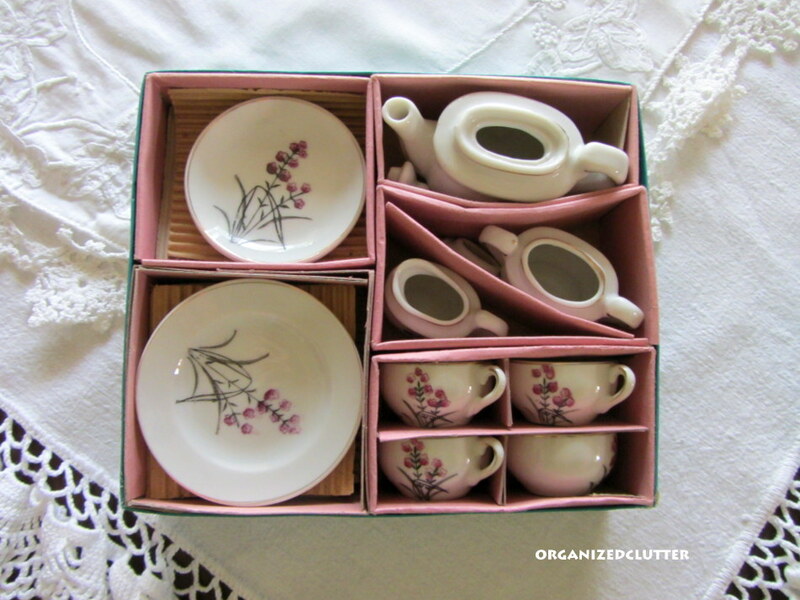 I'm impressed that your childhood tea set is intact, even in the box! My set was blue willow and I have one lonely plate left. I love this! How sweet that you still have your childhood tea set. 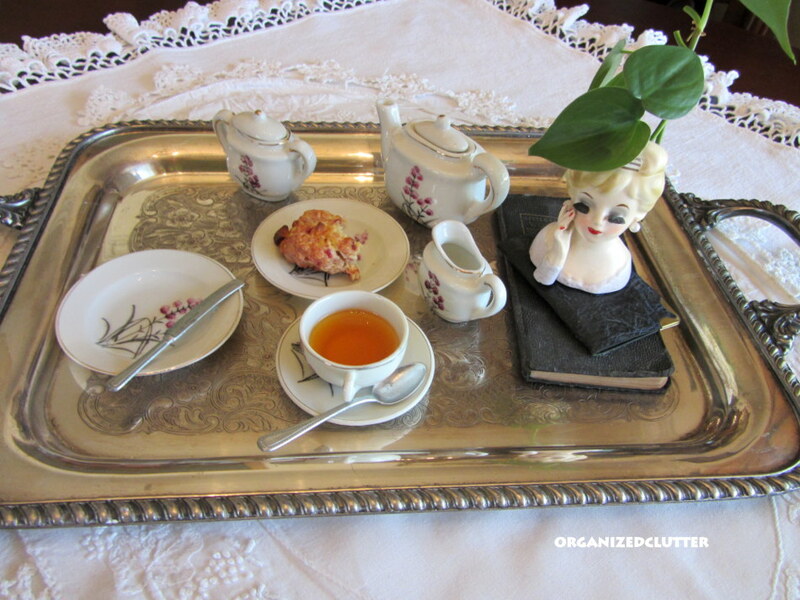 It is so adorable and I love the tea tray you set up! So cute! I'm kinda jealous of your childhood teaset! :D I always wanted one, but don't remember ever having one. Wow, I love your tea set!! How wonderful that you still have it. I also checked out your faux caramel apples.... adorable!!!!!!!!!!!!!! I didn't have a children's china set when I was a child, but I do now. How lucky you are to have your mother's toy silverware. LOVE IT! I had a tea set that was Alice in Wonderland. I still have it tucked in a box in the attic, waiting for some day when I have my own little girl to pass it along to :) I didn't have the tiny silverware though. So cute! I too had/have a bone china tea set. It was packed in a box very similar to yours. My box was green and white striped. The dishes had a different but delicate pattern. I think I gave it to my grand daughter or I packed it away waiting for her to be older. Can't recall. That is so cute! How wonderful that it has all the parts...and the box...they so often get lost, broken or separated. The addition of the silverware is wonderful! What a darling vignette! 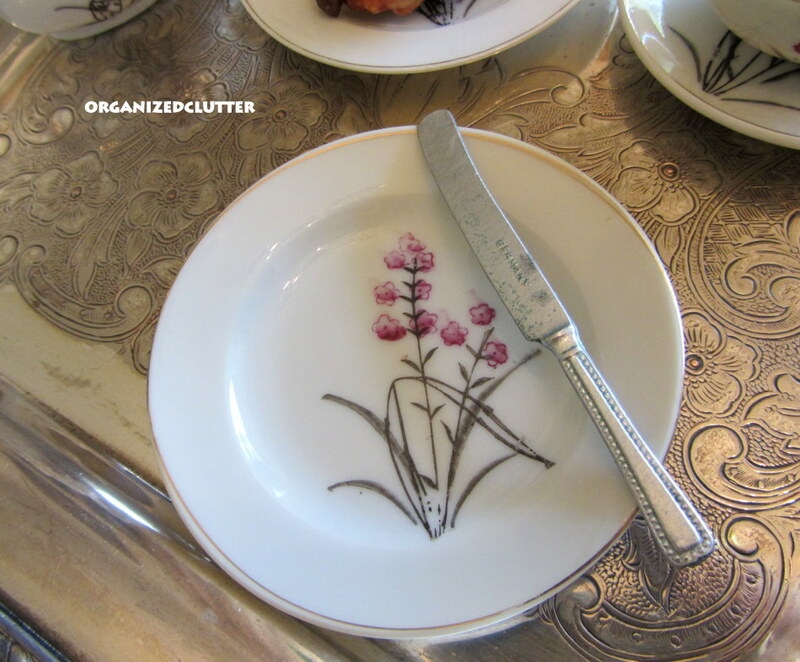 Thanks for linking your treasure to Tuesday Cuppa Tea! So nostalgic. How wonderful that you still have your full set and in the box too! What a good girl you were to take such good care of it. I have silverware like that too. Oh yes! I did have a china tea set very much like that one. We served up chocolate chips and walnuts on it. Such dainty delicacies. lol I also had a little aluminum pots and pans set. Loved those things! Thanks for the fun memory! 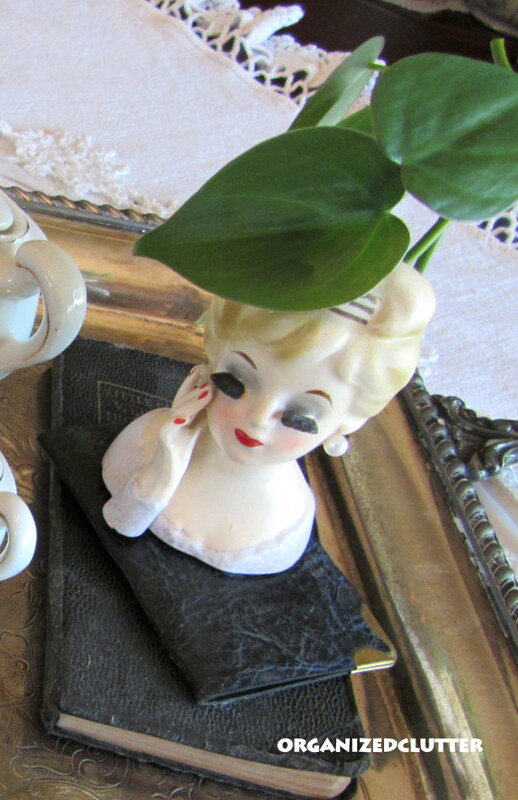 Hi Carlene, Love your toy teaset!!! No, I never had a teaset as a child...must be a Southern thing? I like your head vase too. I had a Blue Willow teaset when I was a child, but did not even remember having it until I was watching some old home movies. There I was playing with the teaset on Christmas morning! With 5 children in the family, I'm sure it ended up being broken. As an adult, I was determined to find a replacement set, and one day I found one at an estate sale. Boy, was I happy! I never had a tea set that I remember, and neither did I have an awesome head like that to set on two little black books. I love that detail! 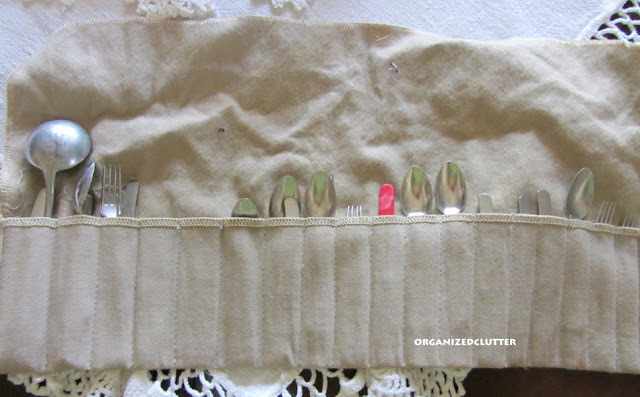 So enjoy seeing your set make it through the years...and that silverware in the little apron thing is perfect! Your teatime looks so inviting!